Asus has announced a new smartphone today in the Philippines. It's called ZenFone 5 Lite, and its model number is A502CG. As you may have guessed from its name, it's basically a lower-end variation of the original ZenFone 5 that got unveiled in January and has been on sale since April. The ZenFone 5 Lite comes with a 5-inch qHD (540x960) IPS touchscreen, an 8 MP rear camera with LED flash, and a 0.3 MP front-facing snapper. At the helm is an Intel Atom Z2520 chipset with a 1.2 GHz dual-core CPU, aided by 1GB of RAM. There's 42Mbps DC-HSPA support, along with dual-SIM functionality, Wi-Fi, Bluetooth, GPS, and a 2,500 mAh battery. 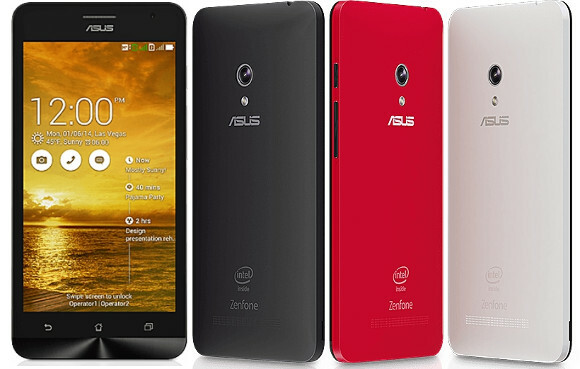 The ZenFone 5 Lite runs Android 4.4 KitKat with Asus' ZenUI on top. The phone's dimensions are 148.2 x 72.8 x 10.8 cm, and it weighs 160g. It will be offered in Charcoal Black, Pearl White, and Cherry Red. Compared to the ZenFone 5, the Lite version has a lower-res screen and front camera, a less capable processor, but (oddly) a bigger battery. As a result it's also slightly thicker and heavier than the original. The ZenFone 5 Lite will become available in the Philippines next week for PHP 5,595, which is about $124 or €99. Right now it's unclear if it will make its way to other countries in the future, but we don't see why it wouldn't.